For things like this, if you can’t always determine if it’s software or hardware problem, a quick test is often to (1) use Guest account or (2) use recovery mode, though that can behave weirdly at times. You might consider getting your copy edited since at least two sentences make no sense. Mouse clicks registering two instead of one has nothing to do with copying or editing items, unless you mean you’re used to one-clicking a sentence and it two-clicks instead then you would notice that the entire sentence is selected rather than the word. That’s pretty annoying! Maybe that is what you’re talking about? Did you try it with your mouse? I use Logitech borrowed from a PC as my mouse and have experienced the one-click two-click phenomena, I thought it was a bug or worse, I do not have an Apple mouse. Altering the double click speed makes absolutely no difference. Clean your mouse, or try an external USB mouse. Sometimes improper double-clicks or triple-clicks are from a dirty mouse or one that has been damaged by liquid or some other substance. Thank you for replying. When you say “clean the mouse,” what exactly does this entail? So often, when folks are trying to be helpful, they don’t provide enough detail. The answer about speed of clicks is utter nonsense. Rate effects nothing with this issue. Someone needs to summon a better answer, because this is a real thing. And more than a bit annoying. 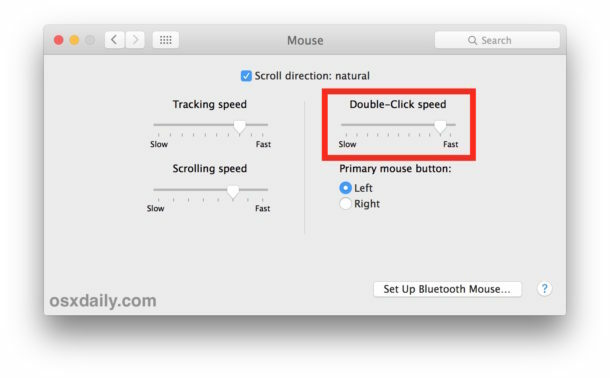 Actually, the click speed does matter, and that can be the cause of double-clicks for some Mac users. That’s why it is a setting to adjust. I have tried various click speeds and always the same result: unwanted double clicks. Can someone explain how speeding up the click speed helps? It seems counterintuitive. I tried deleting those mouse driver files and all that happened was my trackpad lost functionality (I removed all of them just to be sure everything was clear based on your statement that the O/S would re-create them). They didn’t get re-created and I still had the double-click issue. I finally solved my problem by switching to a wireless mouse sitting around in our office. I’d already tried a different second mouse but third time’s a charm I guess. disregard was in in Accessibility (which I skipped over in article) isnt’ working yet. Will try reboot machine. Yes “Pizza” you will find that reading the article is important to learn how to do something, in this case how to resolve the double-click and single-click issue on a Mac mouse. If you skip over the article, you will not learn what is in the article. Reading comprehension is a lesson from primary school that somehow is forgotten on seemingly half of the internets population who apparently all have ADHD from the constant streams of outrage and nonsense poured into their brains from social media to program them into stupidity. Ignorance is blossoming, attention is scarce, people just scan a headline without going further, and the world is suffering for all of it. Take a step back. Slowdown. Read. Learn. I had this problem with the Mac mouse too, but I read the article and immediately solved the problem, I did that without jumping directly into comments to declare that I did not read the article. Thank you so much. This was driving me nuts and now it is working. Thanks. Don’t be silly. We read the articles. In any case, I have tried every available “speed” and that has no effect whatsoever. Also, am using a USB mouse at this [point, and that does not solve the issue. I have restarted and that has no effect. This is a real problem and someone needs to find a real answer to this thing. It is very annoying. 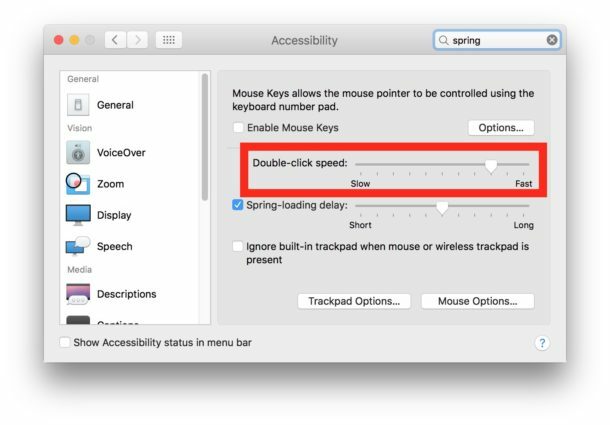 By the way, why are there two preference setting for mouse speed? That makes no sense and may have something to do with the problem?